Could a drone be linked to paddock accident that cost a police horse his life? British police are investigating whether a drone might have been responsible for a police horse bolting in his paddock and suffering a fatal injury. 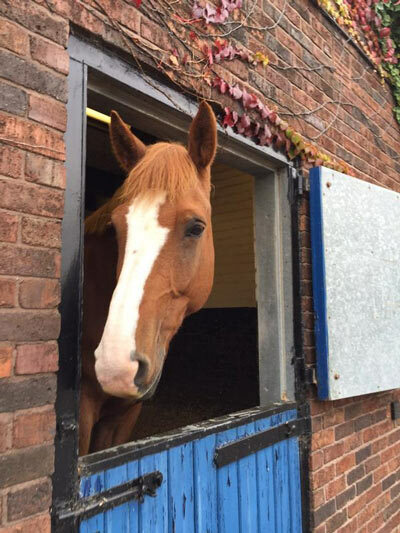 Fimber died following an incident at West Yorkshire Police’s Carr Gate complex on the outskirts of Wakefield on Thursday, October 15. Security camera footage shows that the 14-year-old horse appeared to have been spooked while in his paddock, causing him to vault the fence and collide with a wooden post. Fimber, an 11-year veteran of the force, died from his injuries on the way to the vet. Police are now appealing for information to trace the owner of a radio-controlled drone which they say could be linked to the incident. The radio-controlled drone was found at the Carr Gate site at 1.10pm on Sunday, October 18 – three days after Fimber’s paddock accident. It was spotted by the police helicopter crew as they came in to land. The drone is a Walkera Runner 250, which is about nine inches long. It is widely available and costs around £200. “We have reviewed CCTV footage which shows Fimber bolting, seemingly in reaction to something nearby,” Detective Superintendent Simon Atkinson, who is leading the investigation, said. “This resulted in him being seriously injured and led to his death. We cannot discount that this drone was involved. “There is a possibility that Fimber was reacting to the drone landing nearby or being close to him when he bolted with tragic consequences. “We know he was used to the helicopter taking off and landing nearby and by the nature of his training would be used to loud noises, which tends to suggest it was something unusual that caused him to react. “I am very keen to hear from anyone who has any information that could assist us in tracing the owner of this drone. “I appreciate that radio-controlled drones are becoming increasingly popular and I am not wanting to detract from the pleasure people get from flying them. “Clearly, flying one near to an operational police location such as Carr Gate, where the helicopter is regularly taking off and landing, is not appropriate and could have very serious consequences. Anyone with information is asked to contact Temporary Detective Sergeant Alex Grummitt via 101.